The bright, metallic feathers fan behind the bird, shaking in the air as he prances to attract the peahen's attention. While she may find his mating cries attractive, the loud screeches of peacocks make them an annoying addition to an urban environment. In its native forest habitat, the peafowl's alarm calls warn other birds of approaching predators or humans. The three species of peafowl live in tropical and subtropical forests and rainforests across the southern portions of Asia, India and central Africa. The birds prefer dry forests near rivers and wetlands, but are also found in grasslands, agricultural and urban areas, where they eat snakes, lizards, frogs, worms, insects, flower buds, fruits, seeds and bamboo shoots. The Congo peafowl is shyer than the other species, preferring the dense rainforest. While peafowl can fly, they are ground-dwelling birds who prefer to run rather than fly. When roosting at night, they fly to the lowest limbs, then climb to higher branches. 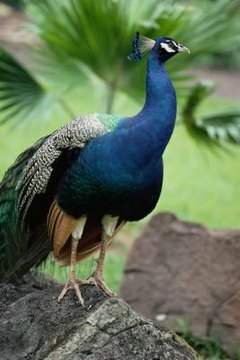 The Indian peafowl (Pavo cristatus), also known as the peacock or Indian blue peafowl, is the famous bird with the fan of brightly-colored, metallic, eyespot feathers. The peacock is actually the male; the female is a peahen. Peacocks live across the Indian subcontinent, in India, Sri Lanka, Bhutan, Bangladesh, Ceylon, Democratic Republic of the Congo, Kashmir, Malaya, Nepal and Pakistan. Peacocks are raised in captivity in many parts of the world and are considered sacred in parts of India. In addition to their native habitat, there are feral colonies of peacocks in the United States, the Bahamas, Australia and New Zealand. The Congo peafowl (Afropavo congensis) is Africa's only species of native pheasant. It lives in the rainforests of the Democratic Republic of the Congo. Unlike the other two species of peafowl, the Congo peafowl doesn't have a long train of feathers. It was first documented in 1936 by Dr. James Chapin. The Congo peafowl is listed as vulnerable by the IUCN Red List of Threatened Species, due to its limited numbers, loss of habitat and hunting. Approximately 150 birds are in zoos around the world and a breeding program is in place. The green peafowl (Pavo muticus) -- also known as the Burmese peafowl, green-necked peafowl or Java peafowl -- is native to southern and southeast Asia, including Burma, Cambodia, China, Java, Laos, Thailand and Vietnam. Like the Indian peacock, the green peacock has a train of eyespot feathers that he can lift and fan out in mating displays to attract the peahens. The green peafowl is listed as endangered by the IUCN Red List, due to habitat loss, hunting for its train feathers and meat and the gathering of chicks and eggs for the pet trade. Farmers consider the birds pests in China.